In advance of Robert S. Neuman's upcoming exhibition at the Thorne-Sagendorph Gallery, Childs Gallery is hosting an event to promote the exhibition, and provide a venue to discuss funding for the exhibition catalogue and public programs. Thorne-Sagendorph gallery director Brian Wallace will be introduced at the event, in addition to project contributors and other special guests. Event Location: Childs Gallery 169 Newbury Street, Boston, MA 02116. Event Date and Time: Tuesday, March 28th from 6-8 p.m.
RSVP: Contact Colleen Johnson at cjjohnson@keene.edu or 603-358-2731. Unable to attend the event? : Tax deductible donations in support of the upcoming exhibition may be made at www.keene.edu/development/online. 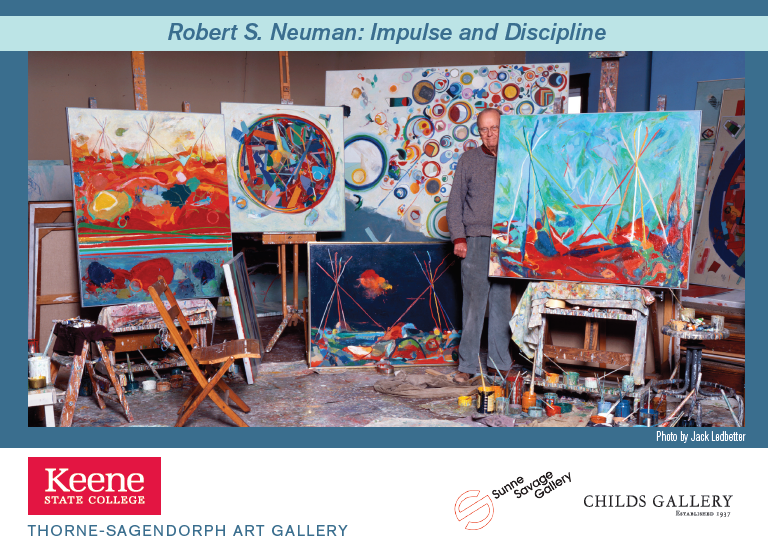 Robert S. Neuman: Impulse and Discipline opens later this year on September 22, 2017 at Thorne-Sagendorph Gallery at Keene Stage College. The Thorne-Sagendorph Gallery was chosen as the location for the latest large-scale retrospect of Robert S. Neuman's work due to his close ties to Keene State. Neuman founded the Keene State Art Department in 1972 and spent two-decades there until he was awarded Professor Emeritus in 1992.